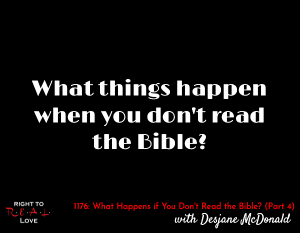 In this episode, Yahnathan continues his discussion with Desjane McDonald by addressing the question: What things happen when you don’t read the Bible? What things happen when you don’t read the Bible? Things that happen when you choose to not read the Bible. Benefits of reading the Bible consistently. The importance of knowing the Most High.